Money might not grow on trees, but chocolate technically does. How it goes from its bean state to your supermarket shelves can be a bit of mystery for most of us. If your sweet tooth has led to curiosity about how chocolate is made, then read on to discover more about this process. Chocolate comes from cacao beans which grow in ‘pods’ on cacao trees in the tropics. While cacao trees are native to Central and South America, these days 70% of the world’s cacao is grown in Africa. Each cacao tree produces up to two thousand pods per year. Inside the pods is a sticky white pulp and about 40 seeds, which we call cacao beans. Cacao beans straight from the pod are incredibly bitter in flavour, and need to undergo an extensive process to gain the flavours we know and love. After they are picked from their pods, the sticky beans are left to ferment, traditionally covered in banana leaves in earthen pits. During this process, the sugars in the beans turn to acid, they darken in colour and any excess pulp residue melts away. For high quality chocolate, the cacao beans are then naturally dried in the sun for about a week to help the flavours develop. When a manufacturer wants to speed up this process they roast the beans over a fire, but this can give the chocolate a distinctive smoky flavour. After being dried in the sun, the cacao beans are shipped off to factories to be turned into chocolate. After sifting through the beans to remove any excess debris, such as rocks and other plants that made their way into the bags, each bean is weighed and sorted by type so that the chocolate makers can ensure their flavours are consistent over time. 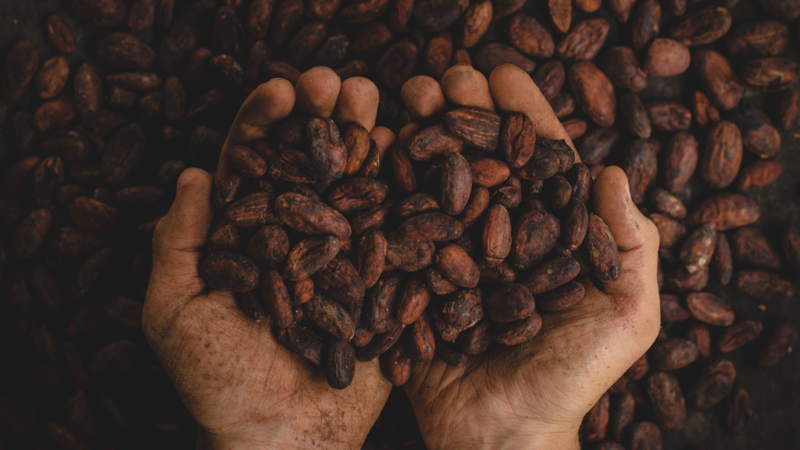 To bring out even more flavours and aromas, the cacao beans are roasted in large rotating ovens for up to two hours. Next the outer shells are cracked and blown away, leaving behind broken pieces of cacao beans with a more chocolatey – but still bitter – flavour, known as chocolate nibs. Once the factory has the nibs, we’re pretty close to actual chocolate, but there’s still a way to go. Next, they make chocolate liquor, which despite what the name suggest, doesn’t have any alcohol in it, by grinding the cacao nibs down into a fine paste. As sugar, cocoa butter, vanilla and milk are added to the chocolate liquor it begins to lose its bitter edge and develop those sweet flavours all chocoholics love. However, it will still have a grainy texture, not the smooth consistency we are familiar with. To refine the texture and make it smooth and silky, the chocolate is run through a series of machines, including steel rollers and a conching machine, to continue aerating the chocolate mixture. As it swirls and mixes, soy lecithin is also added to really bring home that silky smooth texture. This mixing process varies in duration, with higher end varieties continuing it for up to a week to get that rich, melt in your mouth consistency. You want your chocolate to be glossy and for the final product to be really easy to melt, so the final step before pouring them into moulds is to temper the chocolate. This is a process where the chocolate goes through several cycles of heating and cooling, all while stirring, until it gets that nice glossy look. Your liquid chocolate is now delicious and ready to pour into moulds to become the bars and blocks we all know and love.